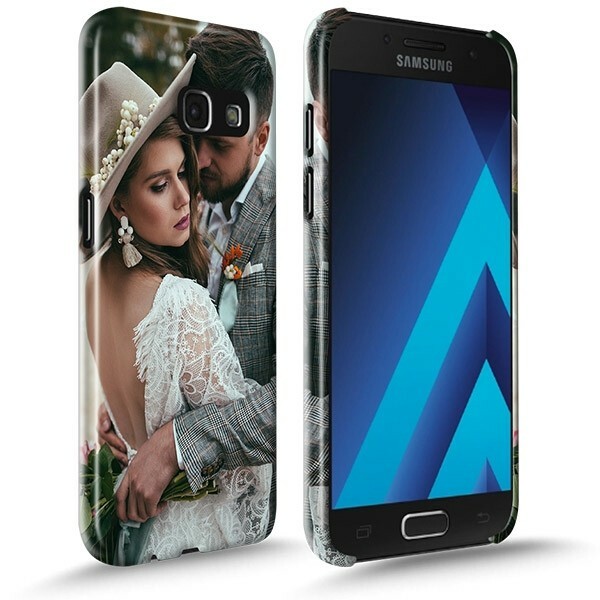 Create your own personalised Samsung Galaxy A3 (2017) full wrap hard case. Your image is printed on the whole back of your case to make it unique. You benefit from the best quality of protection for your photo. GoCustomized takes care of your mobile phone. At GoCustomized, we want your Samsung Galaxy A3 (2017) to be perfectly protected and stylish. The customised Galaxy A3 full wrap hard case provides a total and durable protection against scratches, bumps and falls, which can happen every day. The rigid cover, available in polished white, is extremely resistant. When designing the shell, we thought about including practical openings to ensure that your phone's functionality is not compromised. You'll have a quick and convenient access to the camera, the charging cable space and the side buttons. The Samsung Galaxy A3 (2017) personalised case is simply the unbeatable accessory for your phone. On the GoCustomized website, creating a fully customized cover is child's play. We use a special design module that is very easy to use and intuitive. Do you want to keep your best memories on your personalized Samsung A3 (2017) cover? You can upload a nice photo from Facebook, Instagram or from your computer and place it on the shell as you like. You can also add a text to give the finishing touch! The case will have a complete impression, so that your photo is printed not only on the back of the cover but also on the edges! Professional printing and fast delivery. Once you've finished designing your custom Samsung Galaxy A3 (2017) case, you can receive it at home in no time. At GoCustomized we want to be efficient, so we make sure orders are shipped within 24 hours. Choose fast delivery to receive yourcover within 3 working days. Our shells are printed with high quality ink for excellent results. If you have any further questions, you can always contact our customer service, we will be happy to answer your questions!